Hotel Transylvania 3: A Monster Vacation Review | Pleasing and breezy. "...does have a commendable idea about what to do with these characters after two outings set in the Eastern European woods: Send them on a cruise." "There’s always been a broad, vaudevillian quality to the humour in these movies..."
Confident though he may be, even Adam Sandler probably didn’t think there would ever be three Hotel Transylvania movies. There was a second one because the first was legitimately good; there was a third one because the second showed a surprisingly small dropoff from the first. Unsurprisingly, the dropoff is starting to become more pronounced as the series moves along. There had always been a spaghetti-against-the-wall quality to this series, but strong themes of racial and gender identity tolerance had propped up the weaker comedy bits and left us with a solid package of socially conscious entertainment. As the themes have drooped a bit in the third movie, the pile of wet spaghetti on the ground has grown quite a bit larger. 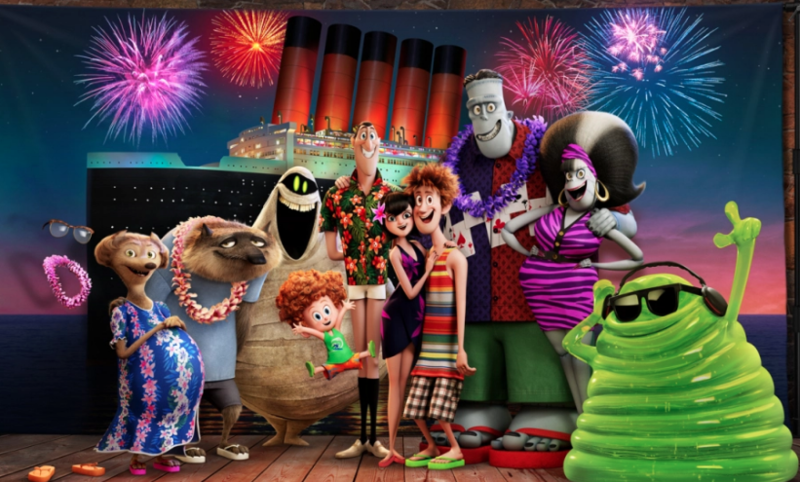 Hotel Transylvania 3: A Monster Vacation does have a commendable idea about what to do with these characters after two outings set in the Eastern European woods: Send them on a cruise. Why not? The cruise is organised by vampire Mavis (voice of Selena Gomez), daughter of Count Dracula (Sandler), who apparently thinks the hectic Transylvanian hotel industry doesn’t give her father enough family time. That family includes her husband Johnny (voice of Andy Samberg), whom she acquired in the first movie, and son Dennis (voice of Asher Blinkoff), whom she acquired in the second. It’s time for dad to acquire someone now, Mavis thinks, as he’s been single since her mum died like a hundred years ago. He thought that was the only time he would ever “zing,” but she’s trying to prove him wrong. Because they couldn’t not be in the movie, all the other characters we know and, yes, sort of love must come along on this cruise, which starts in the Bermuda Triangle and visits aquatic stops that are in some way monstrous. Those characters include the mummy (Keegan-Michael Key), Frankenstein’s monster (Kevin James), bride of Frankenstein (Fran Drescher), the invisible man (David Spade), the wolfman (Steve Buscemi) and the wolfman’s wife (Molly Shannon). Throw in Dracula’s father, voiced by Mel Brooks, because also, why not. Dracula might find himself “zinging” again when he meets cruise director Ericka (Kathryn Hahn), who turns his eyes into hearts (not quite literally, but close enough). Unfortunately, Ericka’s keeping a bit of a secret – she’s the great granddaughter of Abraham Van Helsing (Jim Gaffigan), who in a clever opening montage is shown repeatedly trying to kill Dracula without success over the decades. He’s still around, little more than a head in some kind of mechanized steampunk contraption, tooting around the bowels of the ship and masterminding a plan to kill Dracula once and for all. There’s always been a broad, vaudevillian quality to the humour in these movies, and an expressionistic animation style to match it. That can grow exhausting as a larger percentage of the jokes don’t really hit. Hotel Transylvania 3 has enough jokes that do hit, especially surrounding some new additions to the cast, among them a massive pet dog called Tinkles. But the longer it goes on, the more all-over-the-place it becomes, until you’re watching the characters doing the Macarena as a way of defeating the Kraaken, who is being controlled by Van Helsing using enchanted EDM music. Yes, you read that sentence correctly. But jokes and plot developments are hit and miss in the best of comedies. The real way A Monster Vacation feels like it’s treading water is in the themes department. Namely, it’s hitting the same one over and over again, with less and less oomph. The first film dealt with Dracula’s unwillingness to let go as a parent, and also his daughter’s interest in marrying a human. Love prevailed, and strong messages about parenting and interracial marriage were delivered. The second film addressed the biracial (bispecies?) offspring of his daughter and her human husband, and whether he would manifest more of the traits of a human or a monster. That’s where the messages of racial and even gender identity were encoded. Now, though, the main conflict is whether Dracula will find love again, and if he does, whether a relationship between a monster and a human can blossom. That’s pretty much a rehash of the theme of the first movie, yet without the bite, so to speak. If you squint hard you can find a real-world corollary for the hope that the Van Helsing family can give up its life-long hatred of monsters. Is it another plea for racial harmony in today’s troubled times? Perhaps a commentary on the Mideast peace process? Any of these things are there, potentially, but they just don’t assert themselves strongly enough to feel satisfying. 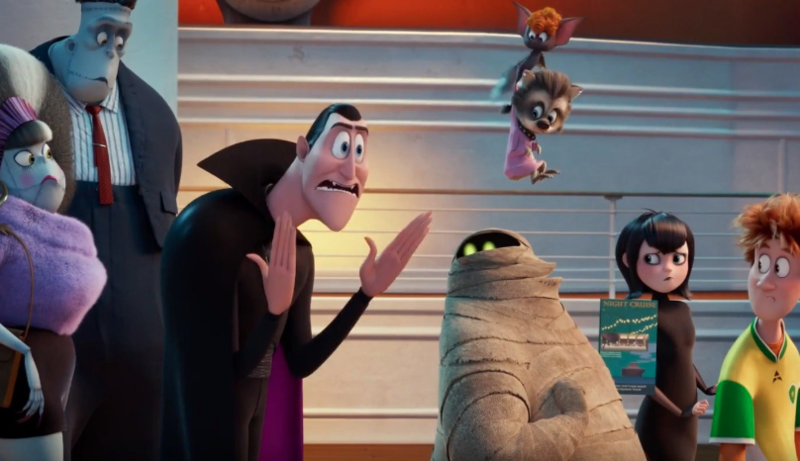 Hotel Transylvania 3 is at its most fun when it’s just imagining how its characters would interact with the standard components of a cruise. It’s pleasing and breezy to see them donning bathers and Hawaiian shirts. But that isn’t really enough to sustain the franchise, especially when it once existed on much sturdier stuff.